I ran out of time and had a couple more things to show today. Here's the first that I ran out of time for. 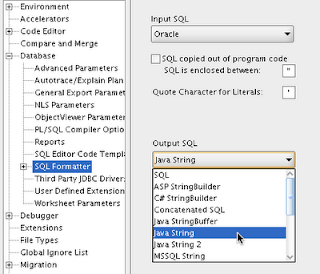 The thing I meant to show was the ability to use the sql formatter to format your sql in the worksheet into a string for other programming languages. I'll show how to format for java here. 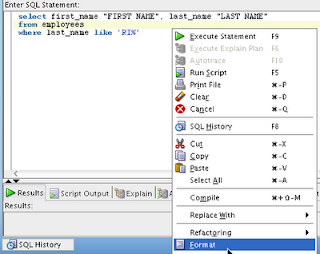 First here's the starting sql. You'll notice I even put in aliased column names quotes. Now the preferences have to be changed for how to format. I'm going to try to add a simple right click -> Format to Java or something in the future but for now just change this preference. And the sql query is properly escaped and ready to be copy-n-pasted into your favorite java code.